You may think your two-flat with the bitchin’ wooden kegger porch in the back and view of Wrigley Field is the ultimate in Chicago living. 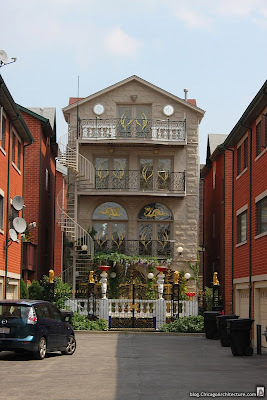 But we think this home at 1908 South Louis Parkway in Chinatown is probably the city’s best, or at least most interesting, townhouse. Wedged into a development of seemingly identical townhomes just west of the Chinatown Gate, this home is festooned with faux luxe. From gilded gates to gilded dog statues to gilded dragons on the windows. There’s more wrought iron than an Indiana steel mill. 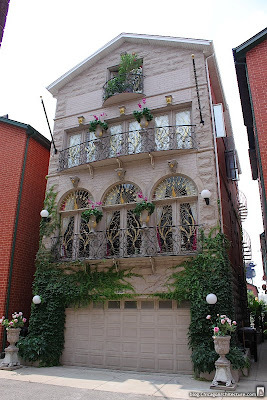 And while the neighbors’ facades are red brick, this one looks like good old Joliet limestone. Last we checked, this 3,500-square-foot home was actually for sale. The real estate listing said that inside there is a formal tea room among other un-necessities. Asking price? Well over a million dollars. Unfortunately, money doesn’t always buy taste.